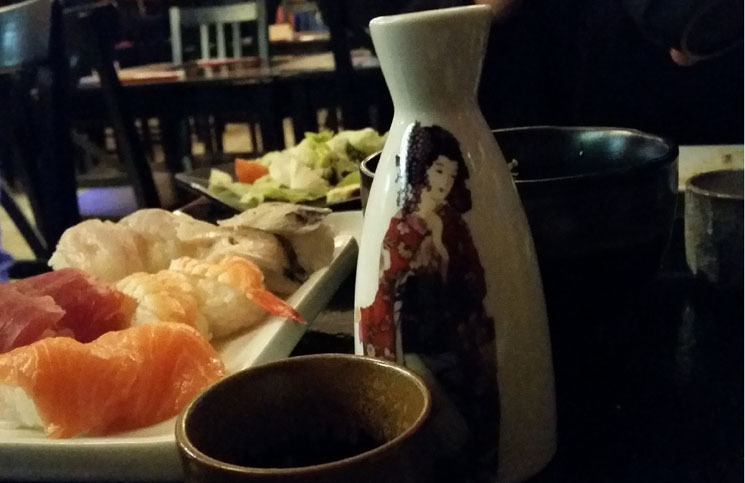 If there’s something we simply have to indulge our senses in on a regular basis, it’s Sushi. I remember the very first time I tried ‘raw fish’. I have to admit I was a little apprehensive (imagining it to be slimy and slippery) but the fact is, it’s so not what you think it is going to be, but 100 times better. Especially a fresh and beautifully cut piece of yellowtail, albacore or tuna!!! Mmm, it’s mouth-watering! The problem we have found though, is that when one doesn’t live in a big city, it’s not so easy to find that perfect Sushi restaurant where you are offered a good selection of raw fish, that is unless you happen to find an excellent sushi restaurant outside of the city, so we make a little sacrifice. That’s the case with Nippon Inn, though I will say that it’s a great little place when you need a ‘sushi fix’. 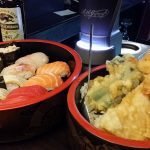 Very low key, casual and laid-back, this type of café style Sushi restaurant is known as an ‘Izakaya’, a Japanese drinking establishment that serves food. 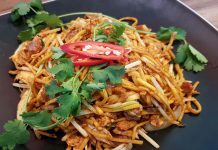 It fits in nicely with the overabundance of Turkish and Middle-Eastern restaurants that populate the Charminster Road in Bournemouth, and since they’re the only Sushi/Japanese restaurant in the area, there’s absolutely no competition! The young staff are friendly and attentive yet leave you to enjoy your meal without too much bother. 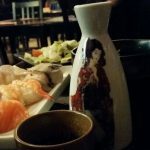 The menu offers a variety of Sushi, hot and cold appetisers and main courses, and they have something for everybody’s taste whether it’s meat, fish or vegetarian dishes you prefer. 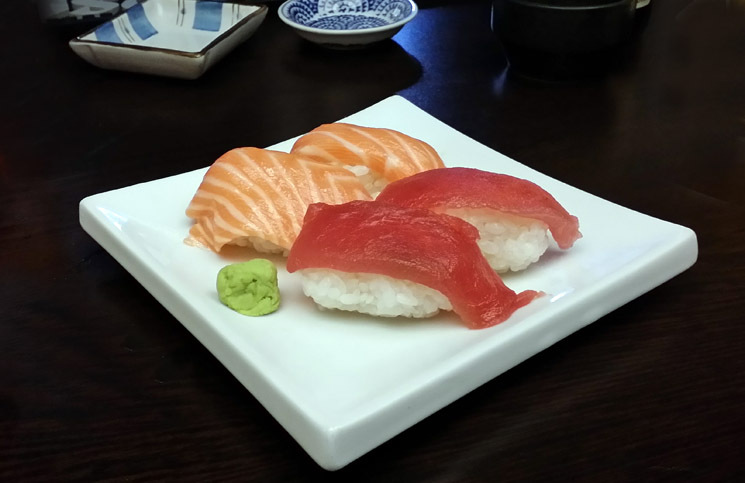 The Sushi menu is simple and has definitely been created to suit the UK customer. I mean, I highly doubt a Japanese person would eat Tuna Mayo Maki, and nor will I! If you stick to the standard Tuna and Salmon then you can’t really go wrong – it’ll be fresh because it’s something that everyone is eating! Sadly they don’t sell yellowtail here which is a great shame, as it’s my absolute favourite – soft like butter and tasty too! 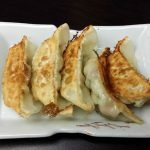 Gyoza – vegetarian dumplings that are just full of flavour and stuff with garlic! 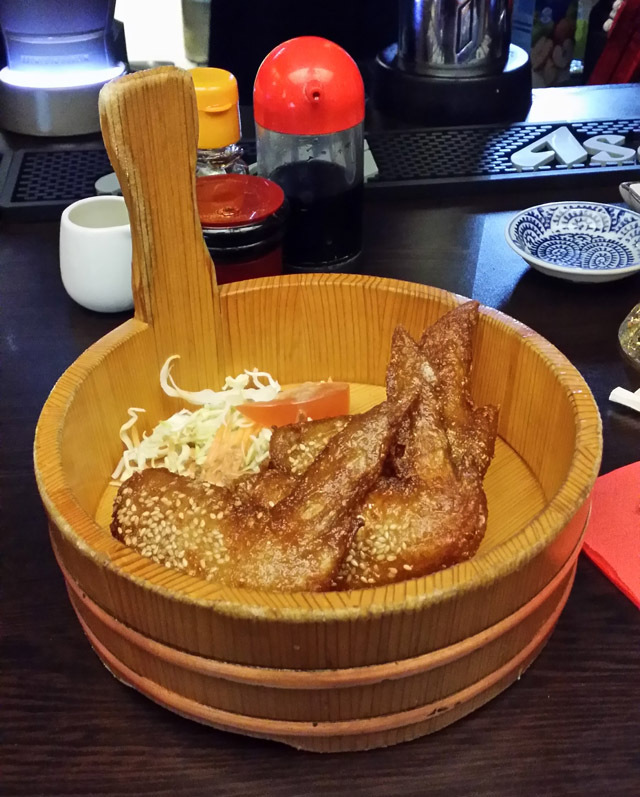 Goma Teba Chicken – Chicken wings with sesame – wow, these are delicious! Crispy, tender and perfect as an appetiser. 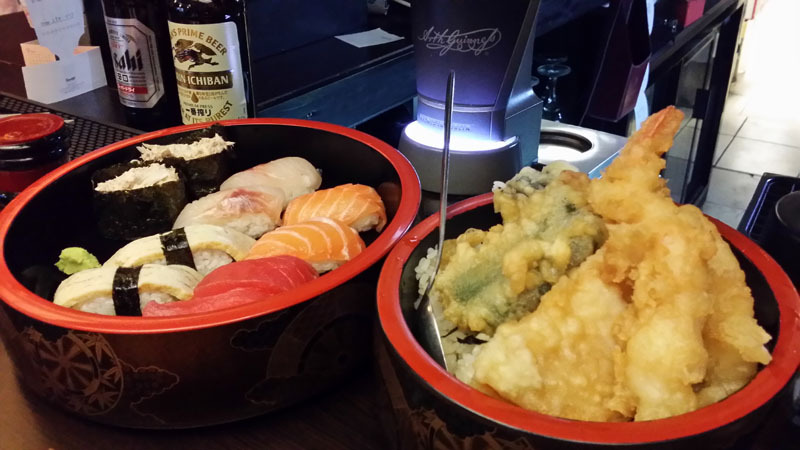 Tempura – a mixed bowl of vegetarian & prawn tempura, deep-fried in a light batter and served with dipping sauce. 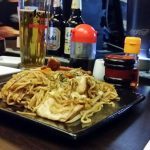 And all of the above are washed down with a nice cold Japanese Beer – Asahi, Kirin or Sapporo – whatever your preference, though the restaurant also has a selection of Saki, spirits and domestic beers too. 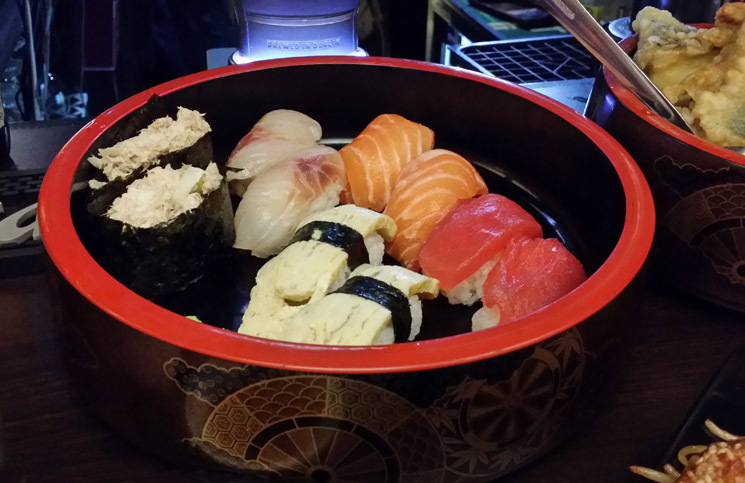 We’ve eaten at Nippon Inn more than a handful of times over the past year or so and have to say they are consistent. 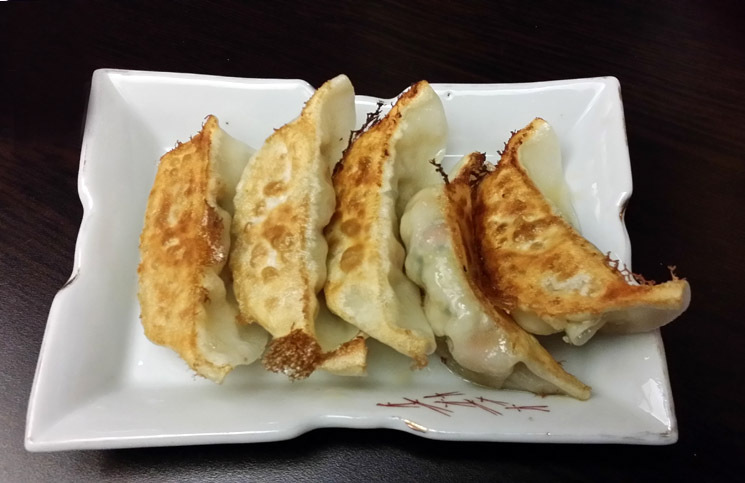 Food is always fresh, and cooked immediately on order. We never have to wait, and are served quickly – that’s the joy of eating raw I suppose! There’s always more than enough to eat but if you want more, you simply have to order it. You’ll never be rushed away from your table and you’ll never find you’re sitting right on top of somebody else (unless you want to of course)!!! 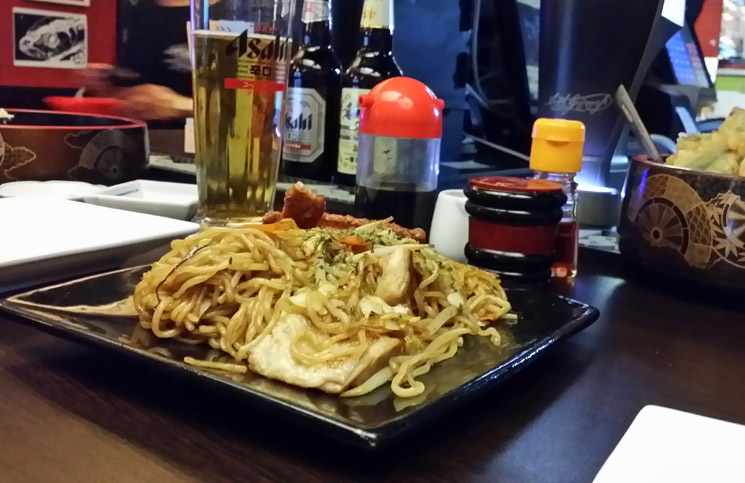 If you really feel like eating ‘Japanese Style’ then book one of the tables at the front where you can sit cross-legged on the floor for a truly Japanese experience! 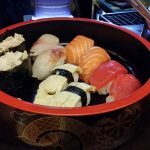 So, though I have said it’s not the best sushi, it’s the best that Bournemouth currently has to offer in the way of sushi, and you’ll always get an enjoyable meal at a reasonable price… and you’ll always go back for more! We do! Service with a smile, a large choice of sushi, while not the best, it is as far as Bournemouth in concerned.